Your caring and gentile dental practice. Steven F. Spector D.D.S. has gained trust and confidence in the community because we do not simply “push” new medical “trends” or procedures. We pride ourselves in having a close communication with our patients and address their needs in a kind and courteous manner. Dr. Steven F. Spector has been practicing for over 28 years and understands the importance of a good relationship with his patients. It is our belief that the patient has the greatest role to play in their treatment and we are there to help, guide, and correct any unhealthy habits and prescribe when needed the appropriate treatment. Serving the community of Lindenhurst, New York, is our pleasure and a joy because the community is vibrant with all walks of life. 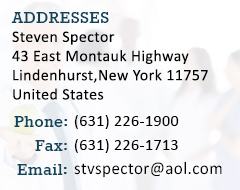 Contact us today and schedule an appointment to see what Steven F. Spector D.D.S. has to offer and you too can know what it’s like to have a compassionate doctor. Copyright © 2015 stevenspectordds.com. All Rights Reserved.